Coverage of NW Challenge is presented by VC Ultimate as part of their season-long support of our women’s coverage. All opinions are those of the authors. Please support the brands that make Ultiworld possible and shop at VC Ultimate! BURLINGTON, WA—Come to the Northwest, they said. Bring all your talent and your ranking points, and you’ll get the chance to play the division’s best teams. And while you’re getting spanked by Dartmouth, the Northwest will quietly steal all your bids for themselves. This weekend, the Northwest region emerged as the big picture winners while Dartmouth proved they are still the best squad in the division, no matter how few regulation games they play during the season. The weather held up and teams were able to measure each other up in the weak sunshine and the gusty wind. Many of these teams, after all, will see each other again in Milwaukee. #1 Dartmouth Princess Layout handed UC San Diego just their third loss for the season—and first not at the hands of Stanford Superfly—in the tournament final, taking down the Psychos 15-11. UC San Diego had opportunities, but their nerves and Dartmouth’s offensive dominance kept them out of contention for most of the second half. While the teams grabbed breaks off each other early, Dartmouth notched two more near the end of the first half to build a lead that they’d only expand by the end of the game. Dartmouth played loose, comfortable chemistry ball for most of the final. Julianna Werffeli, Caitlyn Lee, and Lily Eisner handled together on most points. Downfield Jaclyn Verzuh and freshman Claire Trop were the favorite targets for big hucks. Dartmouth’s only moments of discomfort or hesitation happened in UC San Diego’s several zone defenses, including a box-and-one on Julianna Werffeli. The Dartmouth stat sheets throughout their 7-0 weekend will be dominated mostly by the names mentioned above: Werffeli, Lee, Verzuh, and Trop. However this season’s Dartmouth looks more versatile and flexible than the team that won a national championship last year. Mae Hardebeck, Maggie Pizzo, Hannah Marr, and Abby Ritterband all played heavy minutes throughout the weekend, facilitating the offensive flow and playing tough person defense. Dartmouth has been quiet for most of the season, but their message at NW Challenge couldn’t have been any louder or more clear: they’re still the best team in the division and they’re ready for bracket games in Milwaukee. #3 UC San Diego Psychos had a similarly strong weekend going headed into the final. They won their first three games by large margins until they faced their feisty and talented SoCal neighbor, UC Santa Barbara, whom they beat 14-11. They picked up their second win of the season over Oregon Fugue with a 15-11 victory in the semifinal via their four-person cup zone and their agile handler movement. Kelli Iwamoto, Samantha Wool, Rebecca Ellis, and Leanne Go know each other well in the backfield, and their rapport translated into improvised cutting patterns and flow that defenders couldn’t stop. Dena Elimelech continued to play most points this weekend and she was a favorite target for UCSD even when she had Jaclyn Verzuh on her hip. UCSD’s rookie status at the elite level showed in their final against Dartmouth, where nerves seemed to get the best of them. Psycho handlers both took riskier shots and played more tentatively than they had in their semifinal, and their energetic style felt more frantic than confident during the final. UCSD had hoped to play Stanford again this weekend to try to finally pick up a 2018 win against their Southwest nemesis. Instead, Dartmouth’s come-from-behind win over Stanford added an additional layer of nerves around the reigning national champions. UCSD will get another crack at Stanford at Southwest Regionals and, if they keep their confidence up, they may get another shot at Dartmouth this season, too. #4 Stanford Superfly‘s semifinal battle with Dartmouth revealed everything you need to know about their ceiling this season: it’s high. Stanford gave Dartmouth by far their toughest game this weekend, and they nearly won. Superfly broke to start the game, then broke again quickly to take a 3-1 lead on the reigning champs. Stanford’s four-person cup trapped the Dartmouth handlers and hampered their run-and-gun offense. When Dartmouth did try to sneak through, Shayla Harris was there waiting. Block after block, Harris managed to set herself exactly where Dartmouth wanted to throw. Then she would sprint down the field to catch the huck, and often the goal. Harris has been one of Stanford’s best players for most of her collegiate career, but if her semifinal performance is a preview for the postseason, then she is on a fast track to POTY contention. Julia Butterfield took on the matchup with Jaclyn Verzuh for the semifinal, and her physical, intelligent defense was as close to a foil as there is to Verzuh’s game in the division right now. Yet Stanford’s defensive dominance emerged from the full roster, from Rachel Gianforte’s handblock to Michelle McGhee’s guardianship of the deep space. On offense, whenever Dartmouth shut down option one or option two, Stanford had an option three and four ready and open. Their system finally looks to be firing on all cylinders, right in time for a competitive Southwest Regionals. #5 Oregon Fugue entered the tournament as a deceptive no. 8 seed—a seeding mostly due to the unique two and three-day format used at NW Challenge—and they battled their way through every game they played. Oregon is no stranger to taking chances and making turnovers, and that style showed in their close wins: they never won a game by more than three points. Oregon’s defense often generated turns—particularly their zone—but their fondness for the deep ball often resulted in long points and unnecessary turns. Hayley Wahlroos played limited minutes throughout the weekend due to a foot injury. Oregon utilized her during capped points in pool play, and even that was enough for the injured Wahlroos to contribute to several late comebacks and wins for Oregon. She didn’t play on Sunday during bracket play, but Oregon expects her back in time for the Series. In her stead, Natalie Clifton, Rachel Hess, and Shae Davis stepped into bigger roles on both offense and defense. And then there’s Ella Hansen. Hansen is one of the best throwers in the division and this reporter will fight anyone who disagrees. In the Friday night showcase, she threw Oregon’s first five goals of the game, and her touch and precision make risky hucks seem like great ideas. It seemed like Hansen played more offensive points through the long weekend than she did at last year’s Nationals, but expect to see both her and Wahlroos in Oregon’s zone this postseason. There were a lot of teams attending Northwest Challenge this weekend, including 20 women’s teams in Tier 1 alone. Below, region by region, is a scouting report for the rest of the very heavy hitters who competed this weekend. 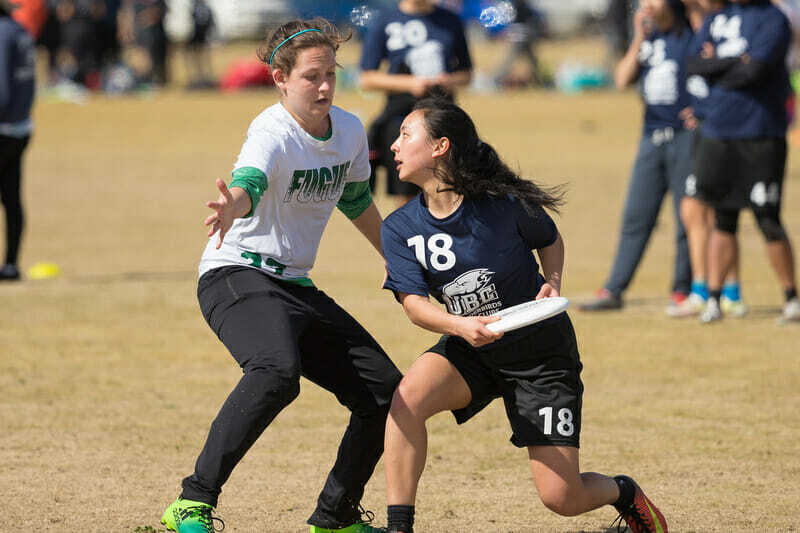 #7 North Carolina played with depth and confidence throughout the weekend, relying on their Callahan nominee Jenny Wei for big plays—skies! handblocks! hucks!—on offense and defense. Elisabeth Parker, Anne Worth, and Wei were able to break most zones they faced this weekend with easy movement and Parker’s hammer throws. Yet they stumbled early against Stanford in the first round despite going up 8-7 at half. Stanford broke back into the game late, and North Carolina only scored once in the second half. The Stanford loss kept them out of the bracket, but North Carolina pushed past Western Washington and UBC in the fifth place bracket with their zone defense and the affinity of Bridget Mizener and Rebecca Fagan to find the endzone again and again. The #3 British Columbia Thunderbirds were seeded no. 2 overall coming into the weekend. They handled most of their pool play games with relative ease, but they were surprised by a surging Western Washington in their final pool play game on Saturday. WWU set smart matchups in the game and they broke late in the first half to steal the lead and eventually the game, winning 12-10. This upset meant UBC had to face Dartmouth in the quarterfinals, where they lost 15-7. UBC plays with all the same elements that have made them successful in the past: speed, disc skills, and good offensive movement. But they couldn’t contain Dartmouth’s deep shots—they simply don’t have defenders who can contend with tall, physical athletes like Verzuh. On Sunday, UBC was upset in the fifth place game 15-8 by North Carolina, who piled breaks on the Thunderbirds with an active zone and lots of energy. UBC is still a favorite for one of the first few bids out of the Northwest region and this was only their second tournament of the season. They have a history of peaking late and there’s certainly room to grow before Regionals for these Canadians. The #25 Whitman Sweets, also playing in their second tournament of the season, submitted a strong weekend of ultimate. Their losses to Oregon and Washington were close, and they earned strong wins over out-of-region programs like California (15-7), Vermont (12-6), and Carleton College (15-12). Last season, the Sweets’ weak point was their cutter movement and chemistry. This weekend, their offensive evolution was clear: cutters like Mackenzie Timbel, Livia Amorosi, and Kaileah Akker worked hard to create space. The talented Soo twins—Linnea and Alissa—shifted between handling and cutting, operating reliably wherever they played. Whitman clearly misses a power handler like they had in Nina Finley or Margo Heffron, who would let the Soo sisters cut instead of staying behind the disc, but their current recipe is still working pretty well. #17 Western Washington Chaos went 4-3 this weekend with strong wins and not-so-bad losses, and their young roster proved their potential for the postseason. At the very least, WWU deserves brownie points for enduring the first round on Friday, in which they battled Vermont amidst sideways snow and rain. WWU enjoyed better weather on Saturday when they took out Carleton College 12-8 and UBC 12-10. Chaos has played most of the season without star senior Maddie Gilbert, who has struggled with injury; during that time, the full breadth of the roster has proven capable of executing smart zones and ferocious person defense. The team’s young cutters, such as Eleanor Joselyn and Camille de Guzman, worked hard in their unique side stack offense, while their handlers have reeled in the 50/50 shots they resorted to in previous seasons. Having a healthy Gilbert playing with Chaos this weekend was just the booster shot they needed to outplay higher-seeded teams all tournament long. The Brigham Young CHI women’s team could be a nationally ranked team if they played on Sundays. We’ve been here before, the arguments have been made, and I’m not trying to stir up trouble. But these women are incredible athletes, and they tore through some of the division’s top teams with the energy and speed of a bullet train. CHI went 3-2 during their two days of play, and their losses were each within three points, to top 15 programs UBC and Vermont. Handlers Jemi Ong and Quincey McKeen moved the disc with skill and looked for Kendra Mitchell and Casstique Williams early and often. Kaylie Caldwell was a blur on the field, and together this squad surged past many of their Northwest counterparts. If BYU chooses to attend Conferences, the Northwest will get the bid that CHI likely earned this weekend. Whatever they choose, they made enough waves during their two days this weekend to earn the region’s — and the division’s — respect. #16 Washington Element seem to have set up a longtime residency in the middle of Ultiworld’s Power Rankings, as well as in many of the tournaments they attend. Their losses before this weekend were all to ranked teams, and their wins were mostly over Southwest squads or lower ranked teams. On Friday night during the showcase, however, Washington showed the team they could be. Under the lights, Washington played Oregon close early in the first half before breaking for a 5-3 lead that they’d maintain for halftime. Washington’s O-line looked comfortable in Oregon’s poachy zone. Handlers Sophia Johansen and Alexa Yadama had the throws to break over and across the zone while downfield Nicole Cramer and Kate Dusenbury worked themselves open again and again. Despite Dusenbury’s affection for getting layout blocks—and she got a lot of them—Washington’s defensive line struggled this weekend to convert chances into goals. On Saturday, Washington was able to earn turns against Dartmouth, for example, with smart defensive looks, but they couldn’t punch them in for breaks. They went winless on Saturday, bumping them into the 17-20 round robin. But despite the rough second half of their weekend, Washington has the pieces to nab one of the Northwest’s many potential bids. #6 Carleton College Syzygy played all their Northwest opponents closely and they won against the other out-of-region teams they played, including Michigan (13-10) and Vermont (13-8). Carleton is a composed offensive team who play possession ultimate and have a deep bench of cutters who can get open under at will during points. Naomi Price-Lazarus and Maya Powell were strong handlers who commanded the pace while freshman Isabel Arevalo was a key facilitator wherever she was on the field. Carleton’s defense had trouble containing the faster, more athletic teams they played this weekend, and their losses to lower-seeded teams were all to teams who love their deep games (BYU, Whitman, and Western Washington). Nevertheless, Carleton College ends their regular season as the favorite to take the lone North Central bid and their young team looks the strongest they’ve looked in several seasons. The #15 UC Santa Barbara Burning Skirts have a recipe that works: move the disc quickly between Kaitlyn Weaver and Hani Pajela, then look for Julia Kwasnick in the deep space. Teams often set their best defenders on Kwasnick and she still got involved in most offensive points. On the other side of the disc, Audrey Brown is UCSB’s best defensive force. The team went an uneven 3-3 this weekend in Burlington; their 14-11 loss to UCSD is a strong preview for Southwest Regionals, where UCSB will fight hard in a crowded field for one of the coveted Nationals bids. #21 Michigan Flywheel played a ferocious opening salvo against Oregon Fugue on Friday, and the game offered a glimpse into this team’s potential. The Michigan handlers, centered by Nina Janjic, managed the Oregon zone—and other zones throughout the weekend—with composure and patience. Meanwhile, Flywheel cutters remained in constant motion behind zones in order to change their angles and get open. Laura Soter, Amy Stoddard, and Phoebe Hopp were particularly impactful downfield, and they weren’t afraid to turn and advance the disc themselves as well. Michigan couldn’t contain the deep game of other teams as well as they executed their own, however, and they let teams like Whitman beat them with a run of breaks. This Midwestern team is still a favorite in the Great Lakes region, however, and their games this weekend are great practice ahead of a long postseason. Comments on "Northwest Challenge 2018: Recap (Women’s)"